Engaging, immersive next generation training. Our training immerses, engages, enhances retention, and accelerates learning. End-to-end immersive training that transforms the way you learn. 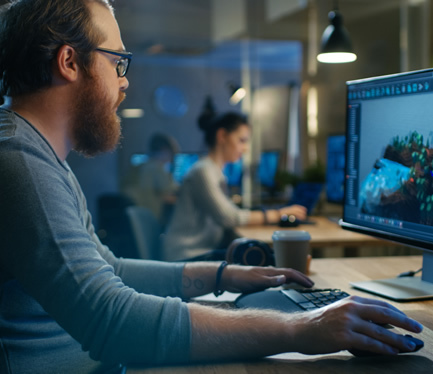 The right modality for your audience Whether you need a 3D serious game, Virtual Reality, Augmented Reality, or Web Based Training course, we can help you build a more engaging training experience. We Design, Develop, and Deliver Immersive and Engaging 3D Training Experiences. 3D Serious Gaming or Simulations are a great way to help your users navigate complex decision making in which the environment is a factor. Simulations sharpen decision-making and performance skills, without exposing employees to risk or equipment to damage. Our Immersive Training solutions not only perform great on gaming hardware and unrestricted networks, but also behind restrictive firewalls running on modest PCs. They can also scale to thousands of distributed users. Our team can help you design and develop web and mobile apps, that work flawlessly, and are beautifully designed. Let our branding experts create a curated experience for your audience that drives user acquisition. Our diverse skillset, backed by a rock-solid design and development team, will help you make your idea a reality. Apps don’t live in isolation, they need multiple interfaces to meet the user where they switch across devices. From their phone to their tablet, PC, web browser, watch, and console, our team can help you design and build a flawless user experience. While 3D Serious Games are a great way to immerse your users into a dynamic canvas, Mixed Reality provides the ultimate form of merging the user with the instruction. Whether you are using Virtual Reality to build a virtual world where the user is transported in order to enhance the realism of the experience, or you need to augment your existing environment via Augmented Reality, we can help you design, build, and deliver it. Our award winning creative team not only creates immersive training experiences but has also created delightful experiences for a Fortune 500 media organization. We create dynamic media solutions that make your messages shine. If you can dream it, CreativeSims can create it, produce it, and deliver it. Utilizing the latest digital production and post production equipment and techniques, CreativeSims’ highly qualified, production personnel can capture that “must have” shot while our digital designers and editors work their magic to provide the “wow-factor” for your media project. Is a page turning PowerPoint bundled into a WBT enough for your users? Can WBTs be engaging? It all starts with engaging instruction that is presented through an immersive process. Yes, you read that correctly, 2D can be immersive as well. User engagement is driven by connecting the user with the content in a deeper fashion, and whether this happens in 3D or 2D the result is always the same... an engaged user is a productive learner. We help you find ways in which your instruction can accelerate the development of expertise. Our award winning instructional design team can help you design immersive and engaging instruction. We utilize modern instructional design techniques such as content gamification, stealth assessments, and adaptive pathing techniques to better engage and accelerate learning, resulting in greater learner retention. At our heart, we are a next generation technology company which uses technology to innovate in the training space. We are not just a consulting company, we don’t just tell you what you need to do based on an ideal IT world that could never be a reality in your environment. We focus on helping you find the right mix of tech and services that will work for you, driven by a real-world understanding of your needs and constraints. Our team has helped clients from Insurance Companies, to Federal Government Agencies transform IT into a current generation organization, capable of delivering agile platforms that are able to respond to ever-changing requirements. How do we build immersive training more efficiently than our competition? The answer is simple, a great team coupled with world class Development Operations automation. We can help your team modernize your development process while managing the increasing complexity inherit in today’s technology landscape. Focus your team on creating great software rather than managing the development pipeline. Deliver features faster via more stable releases, which have faster recovery times. Ideate, develop, test, integrate, and deploy with confidence through a well-oiled DevOps pipeline which maximizes speed, functionality, and innovation. CreativeSims was formed in order to bring our immersive training platform and next generation training solutions to the commercial market. With these innovative technologies comes an award winning, dedicated, and innovative team of industry veterans. Since our spin-off from Creative Veteran Productions, our team has propelled the original game management system into what is now FlashPoint IQ, a collection of technologies that helps us deliver immersive training solutions at a quarter of the cost. CreativeSims maintains a strong connection with Creative Veteran Productions through collaboration on existing commercial and government contracts... contracts that have delivered over 750,000 hours of immersive training to hundreds of thousands of users in both the government and commercial sectors. It was a great pleasure working with your team. Gaming is the future of continuing education and you are on the cusp. We appreciate the patience and expertise of everyone involved who have expertly guided us on this challenging, but always fun, journey into uncharted waters for us. Bravo Zulu! A. Maldonado VHA EES SimLEARN Gaming Project Manager, Contract Officer Representative. A new experience for me…very exciting to be a part of this! I believe we have an excellent, useful product and are working with a great group. The DEMPS Patient Care Provider, Mental Health Scenario was one of the best training experiences I've had in my entire VA career! It really immersed me into an environment that reacted to how I moved and responded to the challenges! We take care of the plumbing, so you can focus on the instruction. FlashPoint IQ takes the common elements required for rich learning games and makes them available out of the box. Ready to plug into your game. It provides all the common building blocks of learning experiences out of the box, so your solution can just focus on plugging them into the instruction, rather than re-creating them. Whether you need a PC Based Training Simulation, Mobile App, Mixed Reality, or Web Based solution, FlashPoint IQ its management and delivery using its standards-based plug-and-play system. Any immersive training experience on any device can be connected. 75% Re-Use of common functions / 25% To make them fit perfectly with your training solution. A truly rich gameplay experience, at a quarter of the cost. FlashPoint IQ was developed to standardize common elements of immersive training to drive immersion and engagement, while reducing cost. Out of the box features such as Media Management, Learning tracking, State Management, Configuration System, and Analytics, to name a few, are pre-built and available to plug-in. Less time re-inventing the wheel, more time designing for your instruction. Training Products can externalize all configuration in a standard way, making it easy to manage via a simple web interface. Need to change reference materials? Point and click your way into an easy update. Need to adjust how your training behaves? Adjust its control panel settings. Manage all your immersive training in a standard way using the same tools across your Training portfolio and delegate the administration of your training games in a granular fashion to your team. Our Steam® like distribution system, the FlashPoint Game Browser, makes the deployment of immersive PC based training solutions a breeze. Through the Game Browser, you are able to publish your training to your end users seamlessly. It makes deployment a fully integrated, end-to-end experience. A standards-based REST API makes the FlashPoint IQ platform accessible from any device and any game, not just games deployed through the Game Browser. Whether through web browsers using WebGL, PC, Mobile, Virtual or Augmented Reality, or Gaming Consoles, FlashPoint IQ can make any training solution a rich experience for your audience. The out of the box functionality is great and gives you most of what you need. But what happens when it doesn’t? The FlashPoint platform was built from the ground up to be pluggable. You can plug additional functionality to tell it to react to events from the user such as when a session ends, you can connect to existing systems, enable single sign on or even replace system functionality to change its behavior. Introducing RIC! The Reconfigurable Immersive Character system by CreativeSims. RIC is a scalable avatar creator which allows the player to customize their avatar with a high degree of flexibility. It includes over 30 physical attribute modifiers, in addition to a host of smart clothing and accessory options. RIC was built to bring AAA game-like avatar customization to the world of serious gaming, while meeting three unique challenges: modular flexibility, extreme optimization, and multiplatform targeting. RIC is a key element in how we lower the cost of delivering our immersive training solutions. RIC allows us to create male and female avatars with wide-ranging characteristics to be used in our 3D immersive training experiences. By allowing the non-keystone characters to be created using RIC it converts weeks of work to create custom avatars into minutes. RIC’s flexibility allows us to create Non-Player Characters “NPCs” that are unique, and most importantly, are efficient. RIC’s efficiency allows more NPCs to be placed in the environment, while still running effectively on lower spec devices. RIC is seamlessly integrated into the FlashPoint IQ platform in order to save user character customizations “DNA” for the user as well as for NPCs. FlashPoint IQ allows users to carry their persona across training experiences which use the RIC character system. The unexpectedness of being the primary role player in the scenario makes you think on your feet. Being deployed always expect the unexpected. This was great training! I feel SO much more prepared to be a DEMPS volunteer now that I did this scenario. The scenario helped me to start understanding some of the issues that need to be considered when being deployed. This has been a great experience. This is presented as a nonthreatening environment to learn and to improve. The feedback at the hot wash was the best. The actors were very realistic and helpful. This training has helped decrease my anxiety about doing a good job in the field. Thanks for offering this. I really enjoy how it helped me know what to expect. I think we made an awesome team. Great method to prepare for deployment! This training was awesome and has helped to prepare me to become a DEMPS volunteer. Training is realistic if you are not able to attend the live training.